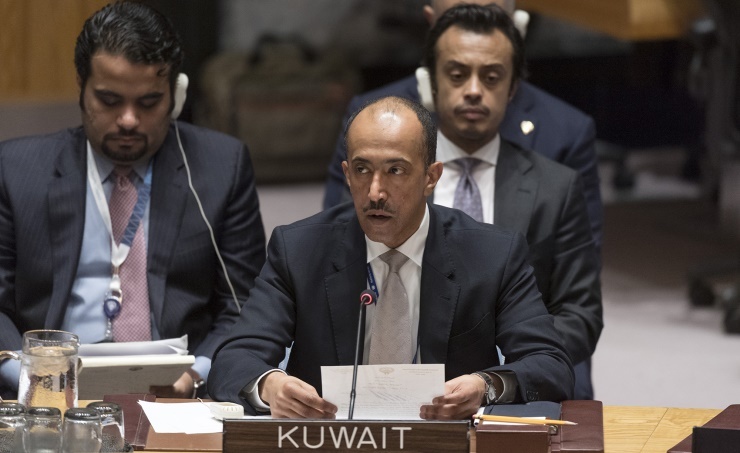 New York, Oct. 11 (BNA): Kuwait backs Colombia's efforts to implement the peace agreement that put an end to the protracted conflict in that South American country, Kuwait's Deputy Permanent Delegate to the United Nations Bader Al-Manikh said Wednesday. The deal, signed in 2016, by the Colombian government and the People's Alternative Revolutionary Force (FARC), paved the way for lasting security and stability and met the aspirations of the Colombian people, Al-Manikh said at a UN Security Council session on the matter. He welcomed the efforts made by the government of Colombian President Ivan Duque Marquez to implement the peace agreement and pursue the peace process that started in 2012, Kuwait News Agency (KUNA) reported. Kuwait is looking forward to the economic development plan to be revealed by President Marquez next month, he pointed out. "Despite the lingering doubts about the process to reintegrate the former FARC members economically and politically, Kuwait appreciates the efforts of the Colombian government to assess the status of these people and pursue the reintegration process," Al-Manikh added. He appreciated the roles of the UN Verification Mission to Colombia, led by Jean Arnault, and the UN Resident Coordinator for the country in realising the targets of the reintegration and reconciliation. Al-Manikh stressed the need to implement the UN Security Council resolutions 2250 and 2419 relating to youth empowerment, peace and security. He also welcomed the Security Council Resolution 2435 to renew the mandate of the Verification Mission as a signal of the commitment of the Colombian government and FARC to the peace agreement. Arnault, the UN Secretary-General's Special Representative for Colombia, briefed the Council members on the Secretary-General's report on the Verification Mission. He noted that, since the report was issued, the key mechanisms provided for the implementation of the Peace Agreement have resumed their work for the first time since the start of the new Government. Regarding the political participation in the country, Arnault said that the current situation was positive, as eight FARC representatives were afforded seats in Congress and all parties in spite of sharp political differences are displaying a collegial spirit. He stressed that economic reintegration remains a subject of serious concern as the vast majority of those in that process still have no clear economic prospects. To succeed, the National Council on Reintegration will need to empower local authorities and to link up with the private sector, universities and other collaborates, Arnault said. He reiterated the UN's commitment to continue supporting the reintegration process.